The monument represents a bell located on the roof of the city hall from 1892- 1926. The granite circles at the base of the bell represent bollards and are in the shape of the octagonal City Hall’s belfry. The plaque tells visitors of the significance of the memorial. Plaque: CIVIC PRIDE / Asheville’s central square has long served the needs of government and commerce. From 1892-1926 a massive city hall with a bell tower dominated the east end. The building departments in addition to municipal offices. In stalls downstairs African-American and white merchants operated a public market. 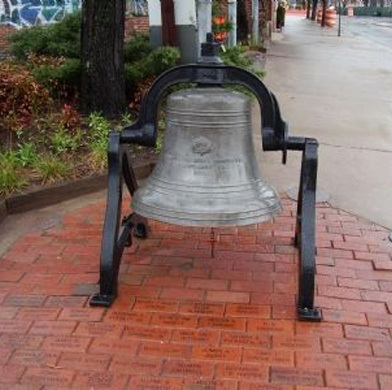 This historic bell is similar to the one that hung in the 1892 City Hall, which stood at the east end of Pack Square. Asheville's central square has long served the needs of government and commerce. From 1892 to 1926 a massive city hall with a bell tower dominated the east end. The building housed police and fire departments in addition to municipal offices. In stalls downstairs African-American and white merchants operated a public market. The monument is part of an "urban trail" developed by the city Asheville in the early 2000s to interpret the history of the city's downtown. The monument is at the intersection of North Market Street and College Street on Market Street. The bell sits on red bricks on the sidewalk, under a shade tree. The plaque is closer to the curb.